The following photos show a comparison between some 1/2400 scale Russo-Japanese War Pre-Dreadnought Cruisers. First up are a pair of photos of the Russian cruiser "Diana" and its sister ship, the "Aurora". 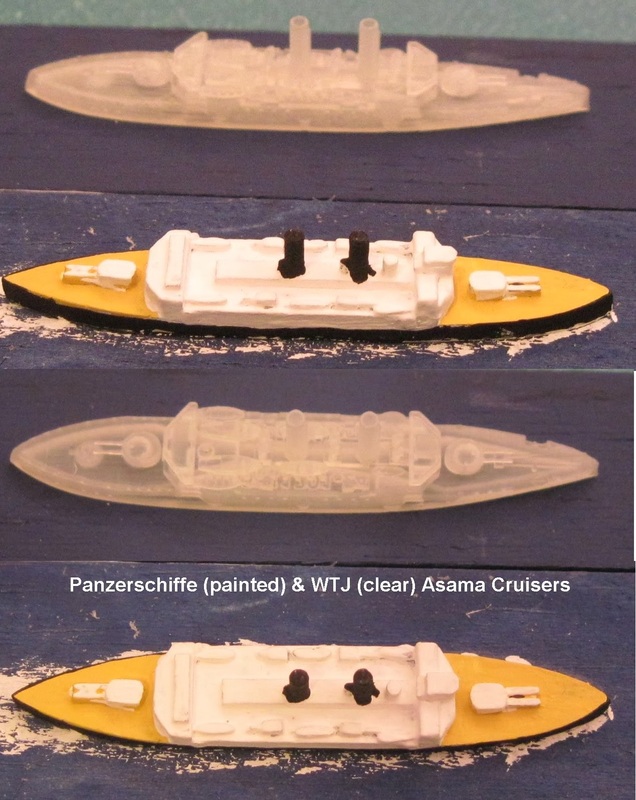 The WTJ vessel is 52mm long, while the Panzerschiffe is 58mm in length. I should point out that both models are right out of their packing material. I have yet to clean either one up in any way. As always click on the photos to see a larger image . . . and open in a separate window to see the best image. 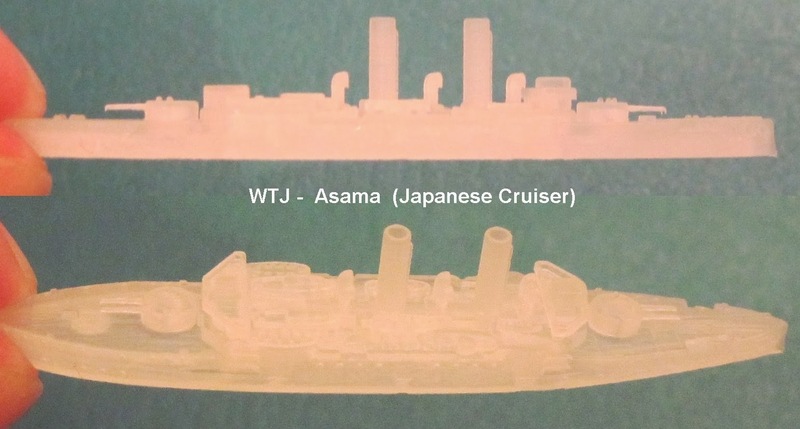 Next up are a pair of Japanese "Asama" cruisers (also usable as the "Tokiwa"). This time it is the WTJ ship that is slightly longer than the Panzersciffe . . . 55mm to 52mm. I must also apologize for the sloppy paint job on the painted ship . . . it was done before my cataract surgeries . . . but it still works fine on the table top. Prices between the two 1/2400 lines are comparable. 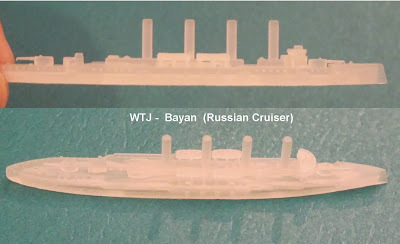 Generally speaking the WTJs are slightly more expensive ($3.75-$4.25) than the Panzerschiffes ($3.00-$4.00) although the reverse is true with the Destroyers where most WTJs are $1.25 USD vs $1.50 USD for the Panzerschiffes. Due to a serious illness, it is over two years since I last posted . . . but I'm feeling better now and today I got my first look at some of the new "War Times Journal" rapid prototype plastic 1/2400 pre-Dreads . . . and I'm impressed. Above are a couple of views I took of the WTJ Russian Cruiser Bayan. 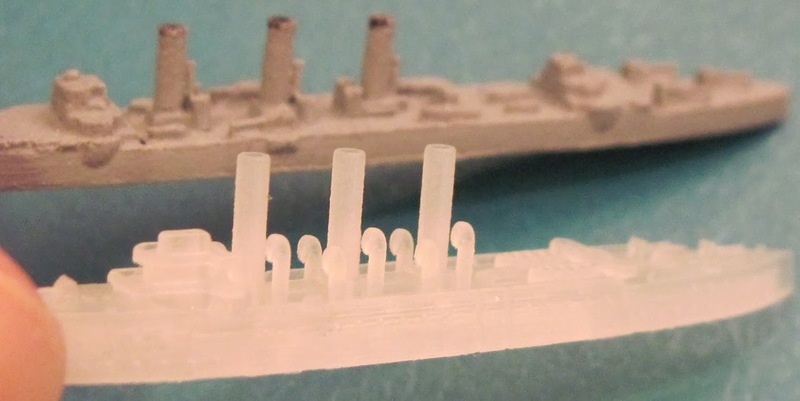 It measures a bit over 56mm in length in its 1/2400 format (please note that all of their rapid prototype plastics are also available in 1/3000, 1/1800 and 1/1500 scales as well as in 1/2400). My next post will show some comparison photos between WTJ and Panzerschiffe versions of the same vessel. I have added some 15 ships to my RJW fleets. Seven Russian ships and the eight Japanese ships posted a few days ago. 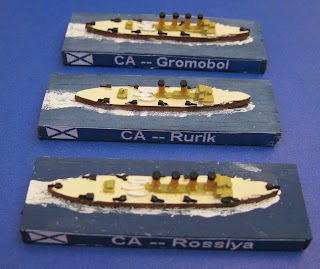 Today I will post a few snapshots of the new Russian ships . . . much as I did with the Japanese additions in my last post. 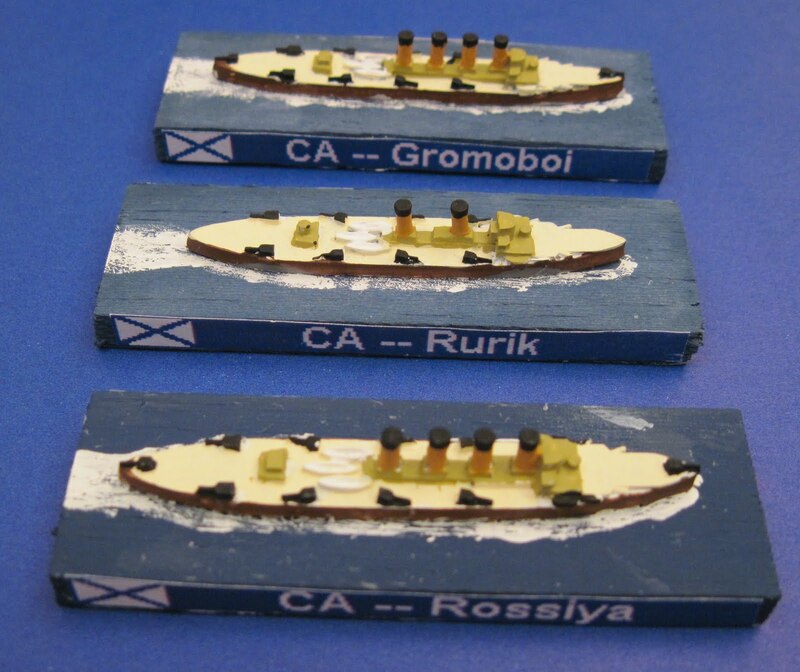 The first photo shows Three Russian Armored Cruisers . . . and remember to click on photos for a larger image. All of these ships are 1/2400 scale Panzerschiffe resin models based on balsa wood that is 3" long x 1" wide x 1/4" thick. The second photo shows four new Protected Cruisers which have been added to my fleet. They will be easy to tell apart . . . notice that each one has a different to their funnels . . . either in shape or number. I have added some 15 ships to my RJW fleets. Eight Japanese vessels and seven Russian. Today I will post a few snapshots of the Japanese fleets and save the Russians for another post. The first photo shows four added Armored Cruisers . . . and remember to click on photo for a larger image. The second photo shows four new Protected Cruisers which have been added to my fleet. And, yes, after gluing on the labels, I do now realize that I misspelled "Otowa" . . . *sigh*. The good news is that I've finished painting over a dozen more Russo-Japanese warships. The bad news is that Bogger doesn't seem to want to upload photos right now . . . *sigh* . . . so you can't see them yet. Still, it shows that I haven't forgotten my Pre-Dreads. * Note that Murdock has now published his account (with better photos). Well it looks like Pete, Murdock and Murdock's son, Alex will be coming over this coming Sunday for my first Russo-Japanese game. We will be playing a cut-down version of the Battle of the Yellow Sea. By that I mean that we will only use the six main ships for each side . . . which should be a fairly even match-up. I've changed my basing scheme by the way. I am using balsa wood (36" x 1" x 1/4") cut into 3" sections. Onto this I've added identification labels onto both sides of each base. These aren't finished yet . . . hopefully I'll finish the basing tomorrow and be able to take a few photos. This will be my first chance to try out the "Naval Thunder: Rise of the Battleship" rules. But it also means that I've got a lot of prep work still to do. I need to make some splash markers . . . note that Col. Campbell (Jim Pitt) has just posted a clever way to do this on his blog. Furthermore, I need to make up some fire and flooding markers. Finally I also need to print out the ship status cards for each ship . . . and I've redesigned them for my own ease of use . . . but now I have to see if I can print them so that they don't clutter up the table too much. And, of course, I just realized that I need to get some munchies too . . . but not tomorrow because we will be putting up our Christmas tree (and decorating it) tomorrow. Right now the basic tree (a local Douglas Fir) is out in the garage waiting to be decked out in all its glory.